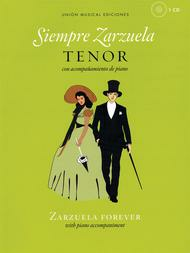 Siempre Zarzuela (Tenor with CD of Piano Accompaniments). Composed by Various. For Voice, Piano Accompaniment. Music Sales America. Softcover with CD. 128 pages. Union Musical Ediciones #UMV100155. Published by Union Musical Ediciones (HL.14041927).ISBN 1780386028. 9x12 inches.These collections present celebrated Romanzas from Zarzuela, the popular Spanish tradition of music theatre which draws on elements of opera, popular song, dance, and spoken drama. With notes on the music and texts and translations.12 songs, with different songlists for each volume.